Embark on the boat and cruise along Kilim River with our local guide on this 4 hour private tour. See native wildlife in their natural habitat such as monkeys, birds, snakes, hornbills when cruise through the mangrove forest. Get the opportunity to see the eagle feeding with lots of giant white colored waters eagles as well as many reddish brown colored flying eagle. 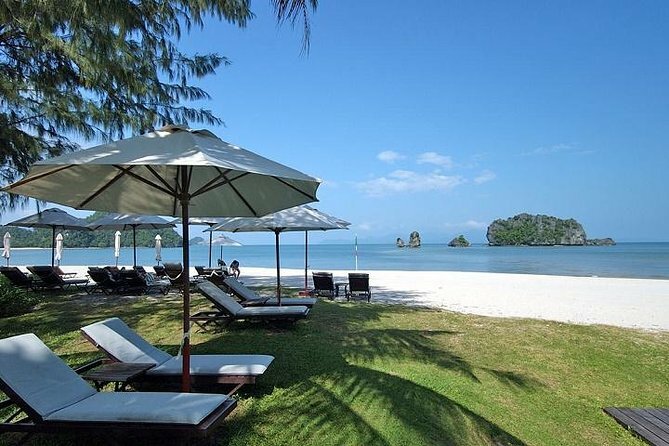 Relax on the white sandy beach and crystal clear cool water with gorgeous breathtaking view of Andaman Sea. Your driver pick you up from your hotel around 9am before you head to Kilim Karst Geoforest Park, one of the biggest hot spots of eco-tourism in the entire region. Embark on the boat and cruise along Kilim River, replete with dense green mangroves and gigantic limestone rocks rising from the river bed. Keep looking at the mangrove area and the muddy flats, you will see lots of amazing animal life such as several species of birds, squirrels, mud crabs, monkeys, and lizards. Next, we will reach the floating fish farm and watch archer fish jump a long way out of the water. The boatman will take you to a calm water area surrounded by high rocks and forest where you will see a grand spectacle – eagle feeding. Boat engine will be stopped and your guide will throws some chicken skin pieces into the water. You can observe and watch eagles flying near to you. The boat will then reach the Bat Cave, aka Gua Kelawar, and see the large population of Malaysian fruit bats that reside here. From the wooden pathway, you will see some monkeys along the mangrove and the pathway soon will lead you to the mouth of the cave. From here, you'll walk through the crocodile cave but there are no crocodiles, it’s just the shape of this shallow cave that allow your boat to go pass. Continue your tour to the Black Sand Beach, one of Langkawi oldest fishing village that offer a sense of calm and serenity. There is a jetty which serves as a nice spot for photography or visitors can simple laze at the beach or sunbathing. Last stop is Tanjung Rhu located just beyond Black Sand Beach. Relax on the white sandy beach with amazing outlook. After the tour, your driver will transfer you back to your hotel safely.